Cathy! I really made this, hehehehe. 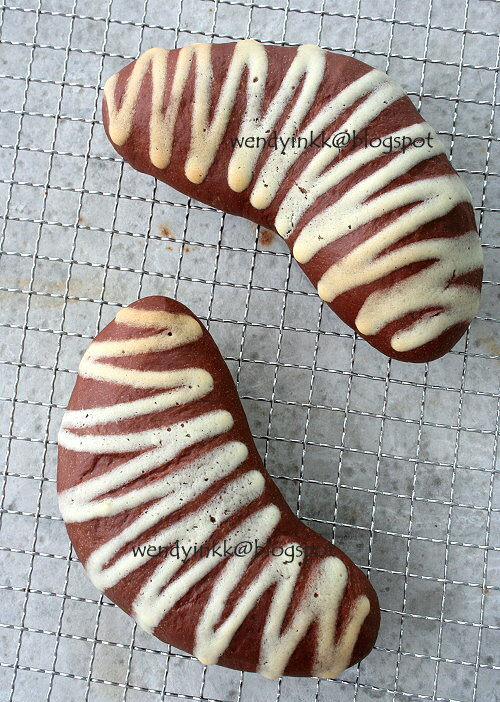 Last year (I made these buns last year, LOL), I saw Cathy posting some boomerang coffee buns and I thought she wrapped them with a banana. She said I was being imaginative and I thought it would work out. 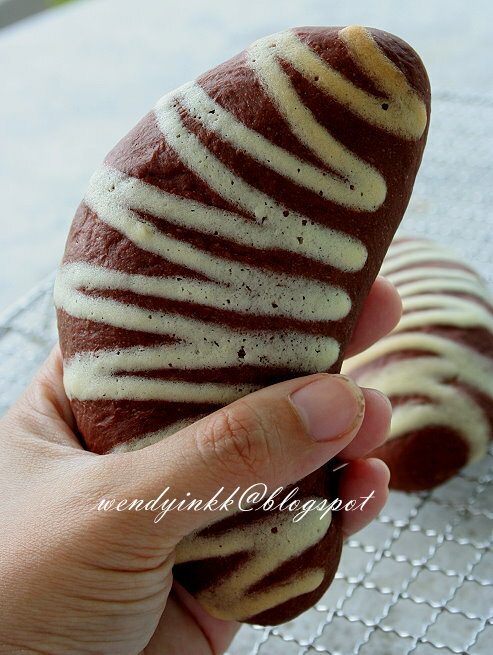 And after I made the chocolate cream cheese buns, I fell in love with the dough and my mom gave me a bunch of 'velvet' bananas. They're perfect since these bananas are slim and curvy! 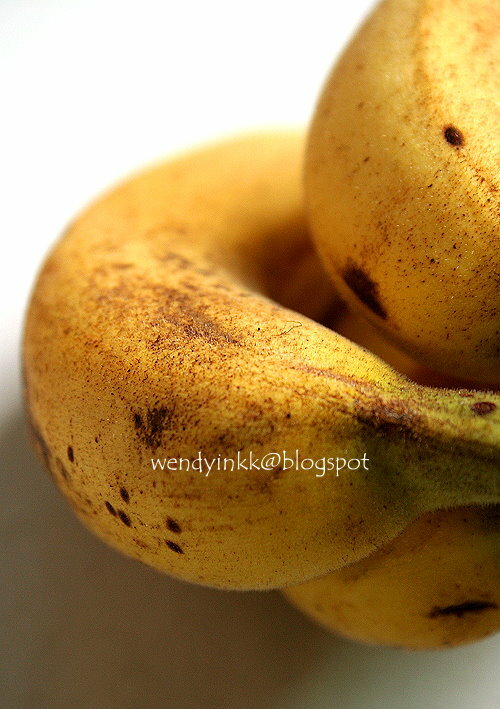 I don't have a proper name for these bananas, but they are called as 'hairy banana' 毛蕉 locally. Velvet banana sounds nicer than hairy banana right? These bananas have a skin that feels like velvet, tastes almost similar to the Berangan banana, but sweeter and ligher in texture. The fragrance is also stronger. This is my mom's latest favourite banana. She has a lot of favourite bananas, ahahah! Besides my mom who loves bananas, my kids are banana fanatics. My Lyanne is the biggest fan among all my kids. Sometimes if one cannot wake her up from her nap, just put a banana near her nose and she'll pop out of bed. She prefers bananas over ice cream and nothing soothes her from her cries better than bananas. Nowadays I don't buy bananas because Lyanne can't stop eating. It's pretty scary. Too much bananas are not too good, anyway, too much of anything is never good. She even has a banana song that she shakes her body to when she eats it. LOL. Ok back to the buns. How was it? When I ate it while it was hot, oh my! 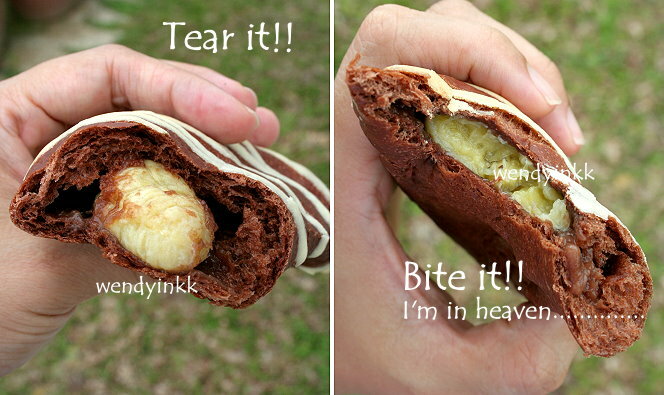 Soft squishy banana oozing out from a soft chocolate bun. You do the imagination! But a few hours later, it wasn't as nice anymore. Still not bad, just that it doesn't make you eat with your eyes closed, with that fleeting floating feeling. 1. Make the dough as per the recipe. Let it proof until double. 3. 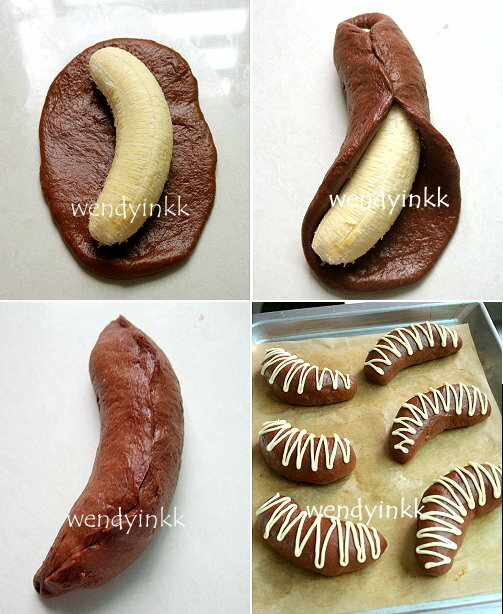 Wrap each banana with dough and pinch to seal the edges. 4. Let them proof for 45 minutes until puffy and big. 5. Preheat oven at 160(fan)/180C. 6. Pipe mexican bun topping over the proofed buns. 7. Bake for 15 minutes or until done. Cream butter with sugar until pale and fluffy. Add in egg and cream it until smooth. 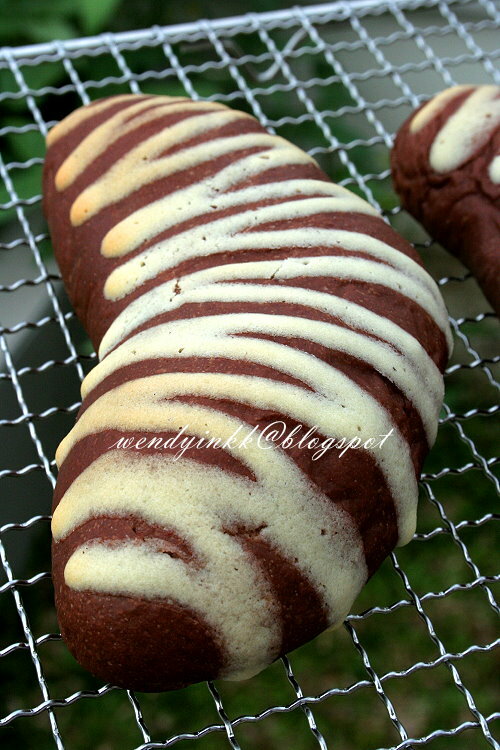 Put in flour and mix until smooth. Put the topping into a disposable piping bag and chillit for 30 mintues before using. Snip the end of the piping bag according to the size you need just before piping. Hairy bananas? I have seen these before. Lyanne is so cute, dancing and eating these bananas. i tak boleh tahan this phrase "Bite it!! i'm in heaven!" Woo! This is so special, i love it! We are in hell tak dapat makan ! Can only imagine the taste each time you posts. Cute model u have there ! Whoa...looks good, although I am not a fan of banana...your daughter is very pretty! Hi Wendy! I salute you for your creativity! 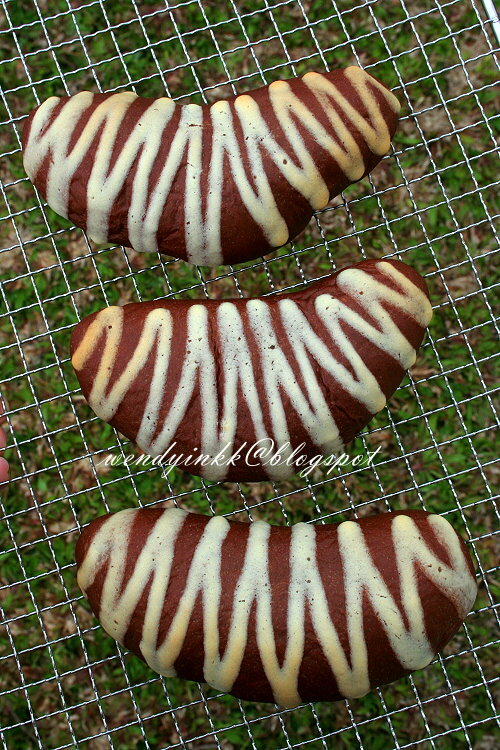 The banana buns look very nicely done! Omg, your Lyanne is so cute doing her happy banana dance! How old is she? Well, if I were a little girl again and mummy makes me something I love, I'd be in heaven too, lol!